The convertible top on one of my cars stopped working a couple days ago. The top was stuck closed (up). Next, I checked the front latch, there are two micro-switches in there. One drops the windows, the other is for the Top Relay. The latch is held in place by two screws covered by the 'alien eyes'. After all that looked good, the rest of it is in back, under the top. I had to get it open. The components back there are the motor, cables, transmissions and control arms. I decided that for now (and probably forever), I will operate the top on this car manually instead of electrically. It's simple, safe, and functional. 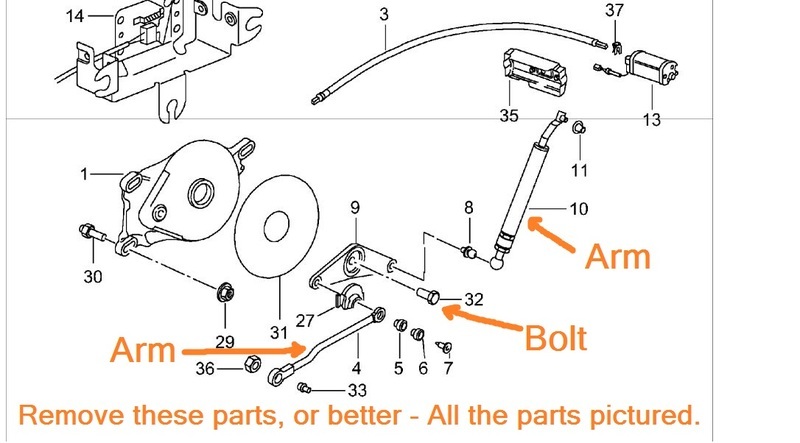 If you remove all the unneeded parts, your car will be about 15 pounds lighter. If you want to restore function later, it it not hard to re-install the required parts. I intend to use the trunk latch method on mine. On the 2000 - 2004 Boxsters the "Convertible top indicator light" on the instrument panel is controlled by a switch inside the left side roof transmission. 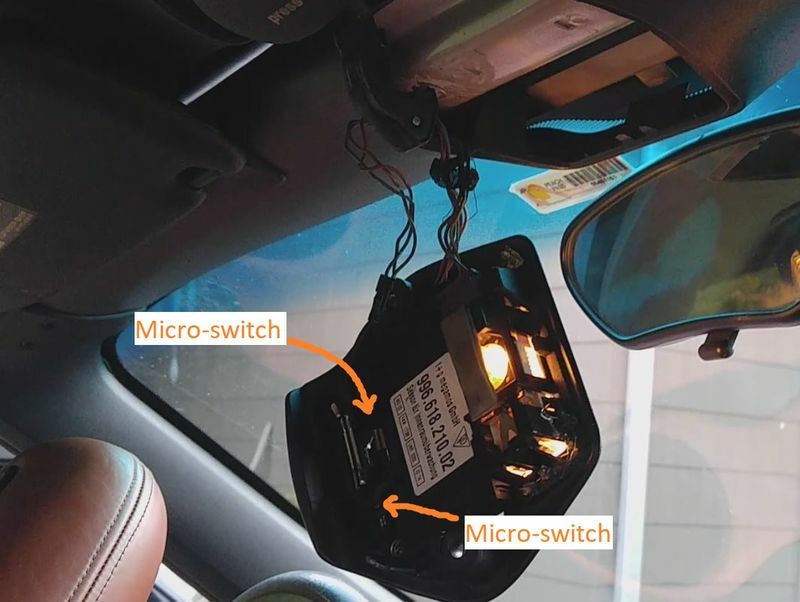 You can make that light go out by jumping the Brown/Black wire to the Brown wire that connects to the roof transmission or just grounding the Brown/Black wire. On 1999 and older the function is done by the "B-pillar switch". It should still operate normally after the top is converted to manual mode. The switch may be bypassed by jumping or grounding the wires to that switch. 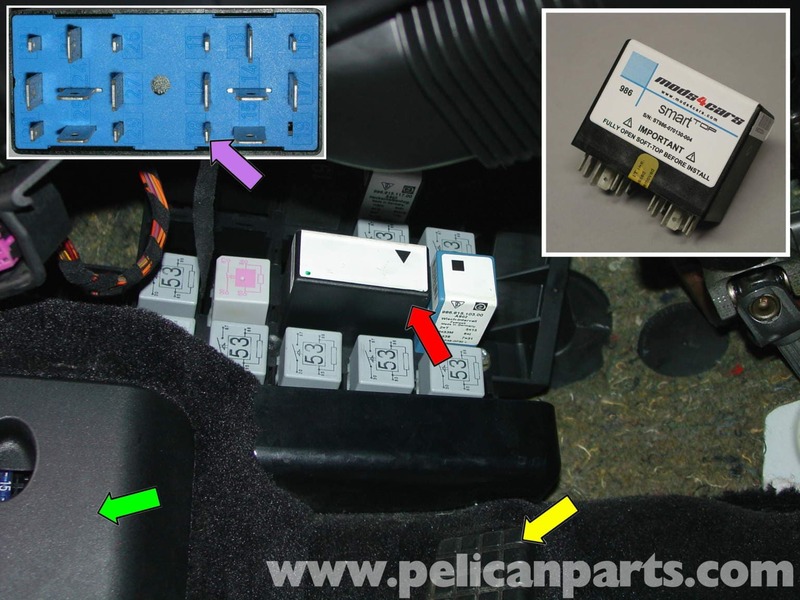 For a 2001, where exactly is this switch located? 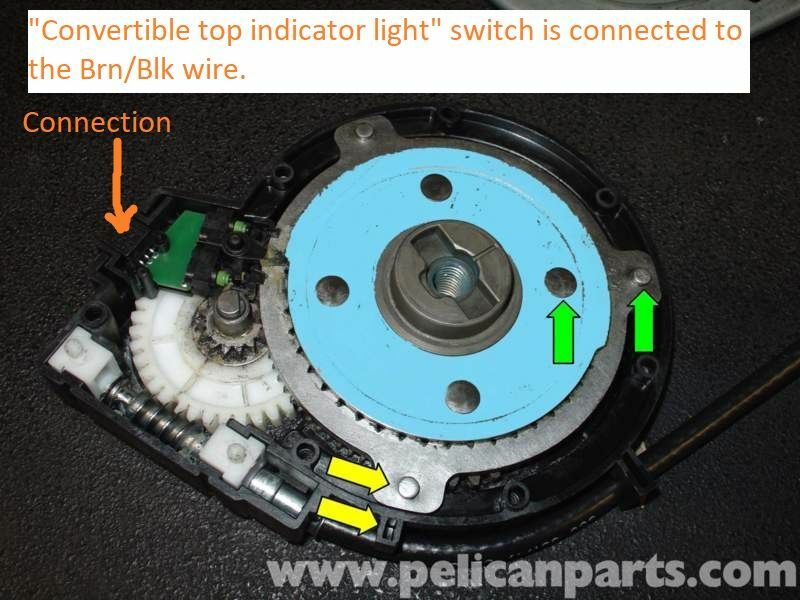 You indicated the "switch is in the left side transmission", do you mean the transmission under the clam shell? 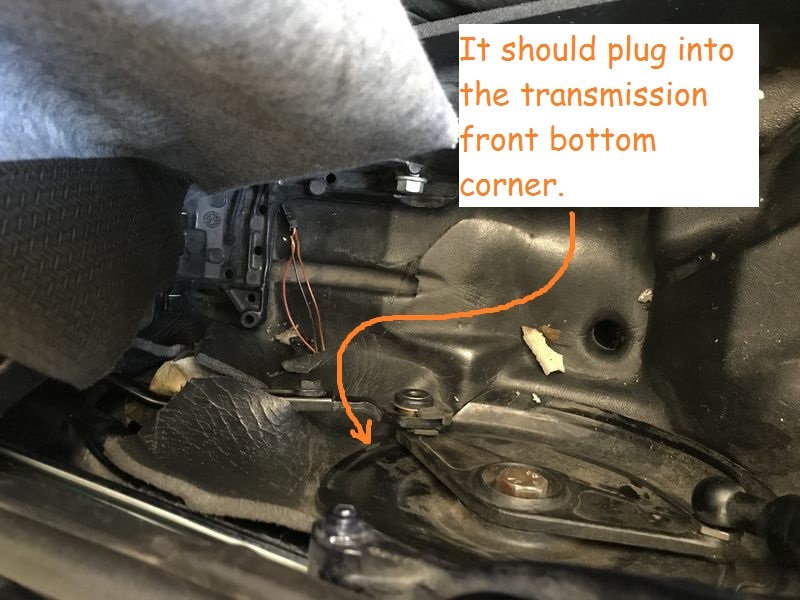 I pulled the transmission off the drivers side but I do not see the switch anywhere around or behind it. 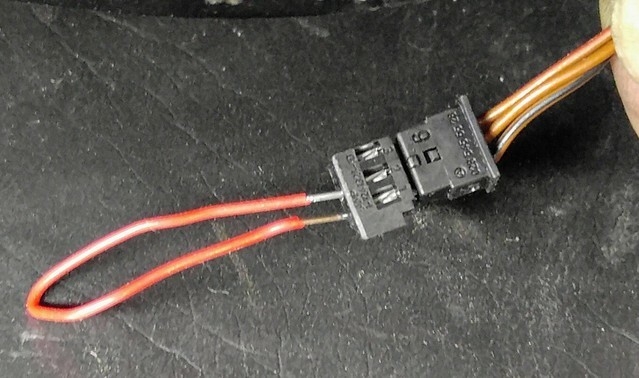 I don't think it's actually inside the gearbox since there are only a few 22awg wires going to it. 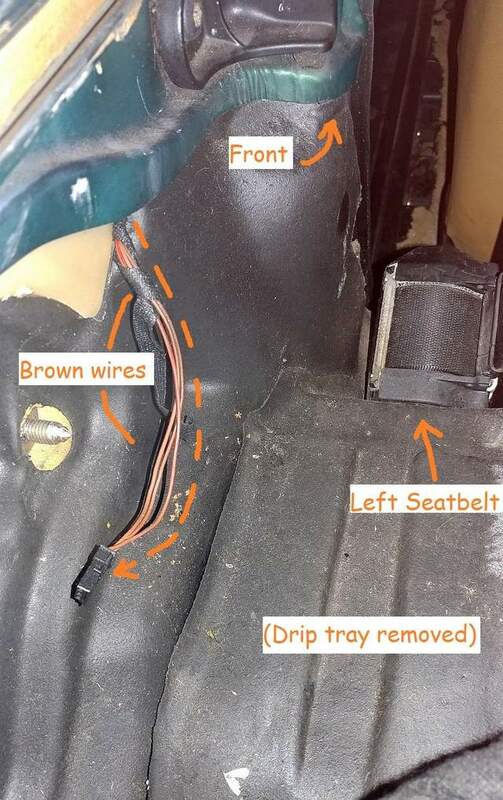 Where is the black brown wire actually located? They are routed up the B-pillar under the carpeted trim piece to the left of the left seat. From there there are routed to the "B-pillar switch" on the '97 - '99, or front of the left side top transmission (should be routed over the edge or through the grey drip pan) on the 2000 and later. Pics are in my following post now..
Last edited by 78F350; 12-10-2018 at 07:02 PM. 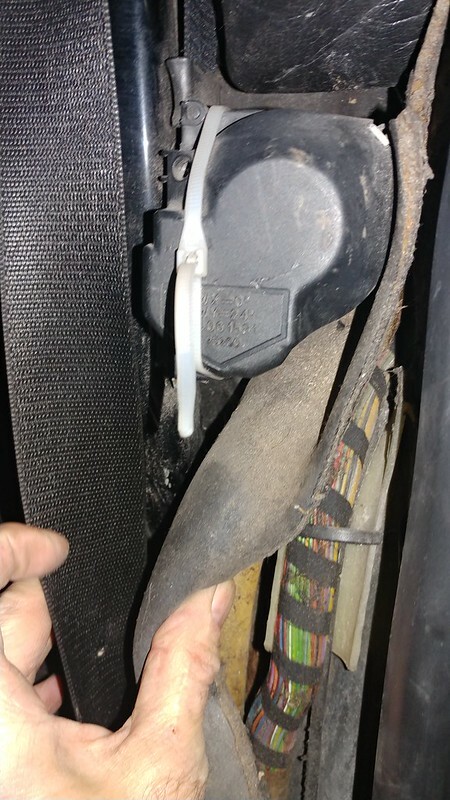 The wires are in a bundle that runs up the B- pillar under some insulation. This is the view from the doorway, looking back towards the left seatbelt. 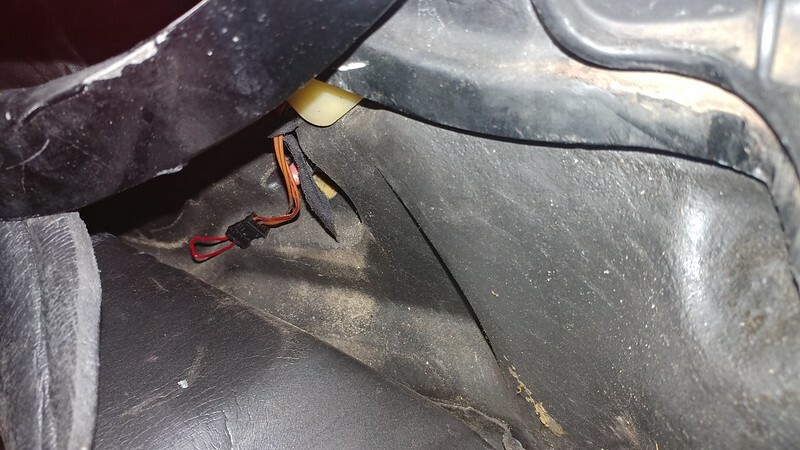 Here the wires are, jumped with a red wire in my 2000 model. I could not see them until I pulled the drip pan away from the outside edge of the car. Last edited by 78F350; 12-10-2018 at 06:58 PM. I took the light bulb out of the cluster on mine.